One of the best ways to support the American economy is to buy products made in the United States, instead of China, Vietnam, or other countries. Many shoppers will choose a product over another if the label specifically says "Made in the USA." 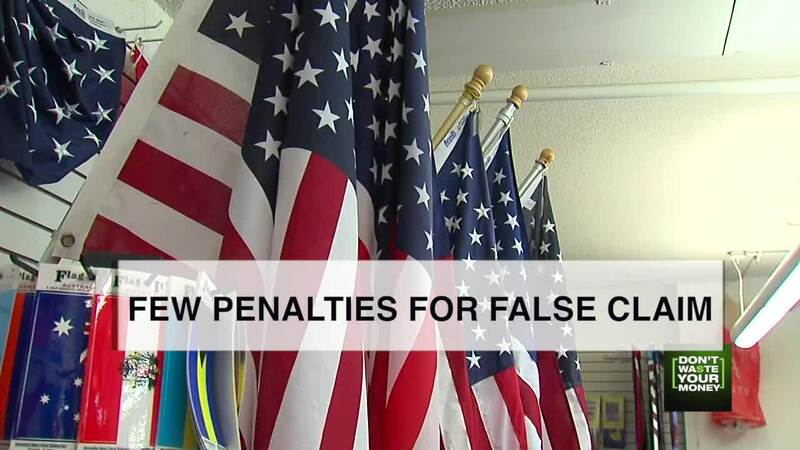 But a new report says plenty of products that claim to be American made may be fudging the truth, and that companies continue to make false claims because penalties are so lax. If you play hockey, what could be better than a Patriot Puck that was made in the United States? It's a reminder of that 1980 "Miracle on Ice" US Olympic hockey team, with the chants of "USA, USA," that rang out in Lake Placid, New York when the Americans pulled off perhaps the biggest upset in Olympic history. Only problem: The Patriot Puck was really made in China, according to the Federal Trade Commission. Nectar Sleep mattresses also claimed they were assembled in the United States, but the FTC says that until recently, they were not. That also goes for a variety of military gear marketed to veterans, where even hats and American flags were imported from China. The FTC recently settled with all of those companies, which have now agreed to stop making false claims. Despite the penalties, it likely won't be the last time companies will claim Chinese-made products to be American made. A New York Times report says even though these companies falsely labeled their products made in the United States, there was no financial penalty. According to the Times, the companies suffered little more than public embarrassment. With a lack of any real penalty, there's little incentive for other companies to stop making false claims. So sure, look for American-made products when you're shopping. But also keep an eye out for companies that stretch the truth, you don't waste your money.